The chest x-ray is one of the most commonly performed imaging tests. As emergency medicine physicians, we order chest x-rays to evaluate patients with a wide variety of complaints. Often times, it is our responsibility to interpret the x-ray and create a management plan before a radiologist has a chance to look at the image. This is true in community hospitals without radiologists available during night or weekend hours, in critically ill patients, or in trauma victims at large academic centers. Several studies have shown a discrepancy between the x-ray readings of emergency medicine physicians verses radiologists. (2,3,4,5) There is wide variability in the rate of misinterpretations reported, depending on the type of imaging, the experience level of the clinician, and the difficulty level of the chest x-ray findings, among other factors. Chest x-ray interpretation is a vital skill as interpretation errors can have significant consequences. False negatives may result in missing life-threatening conditions and worse patient outcomes. False positives may result in further testing, longer ED course and unnecessary interventions. We are taught to be systematic in our approach to reading an image. However, it is not uncommon to zero in on the part of the chest x-ray we are interested in and unintentionally brush over the rest of the picture. This can lead to missed diagnoses and poorer patient outcomes. First- check the patient information, the projection (AP or PA), the date it was taken. Review the aspects that affect the quality of the film. Remember the pneumonic “RIPE” to evaluate the quality of an image - Rotation, Inspiration, Projection, Exposure. When ready to review the x-ray, consider the commonly used “A, B, C, D, E, F” system. B - Bones and soft tissue- clavicles, ribs- posterior rand anterior, vertebral bodies, and sternum on lateral films. 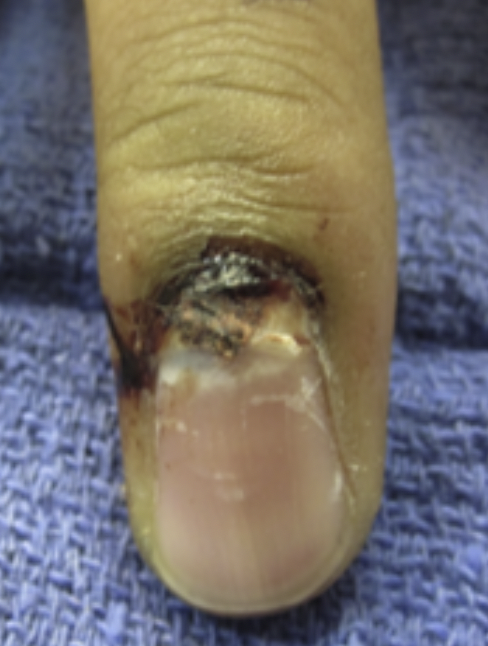 Look for any fractures, dislocations, or lytic lesions. D - Diaphragm- right should be higher than left and you should see a gastric air bubble on the left. Is there any free air under the diaphragm? Evaluate the costophrenic angle and pleura (normally invisible due to thinness). F - Fields- FINALLY, evaluate the lung fields. Lungs are the area of greatest interest, so it is helpful to keep this at the end to prevent distraction. Divide each lung into three “zones” when reading a chest x-ray. These do not correlate with the lobes. Remember, there are 2 lobes on the left (upper and lower) and 3 on the right (upper, middle and lower). There are several things that do not fit perfectly into the A-E categories. Remember that the lungs extend below the diaphragm posteriorly. Look out for consolidation or lesions on the lateral film. Don’t forget to look for air, foreign bodies, and other soft tissue abnormalities. Now that we have refreshed your memory, it’s time to practice! Imagine that you are in a small community setting, working the overnight shift. There are no radiologists available until the morning and it is up to you to read the chest x-ray. Go through the examples below and see what findings you can pick up on these chest x-rays. Case 1: Find the abnormality. 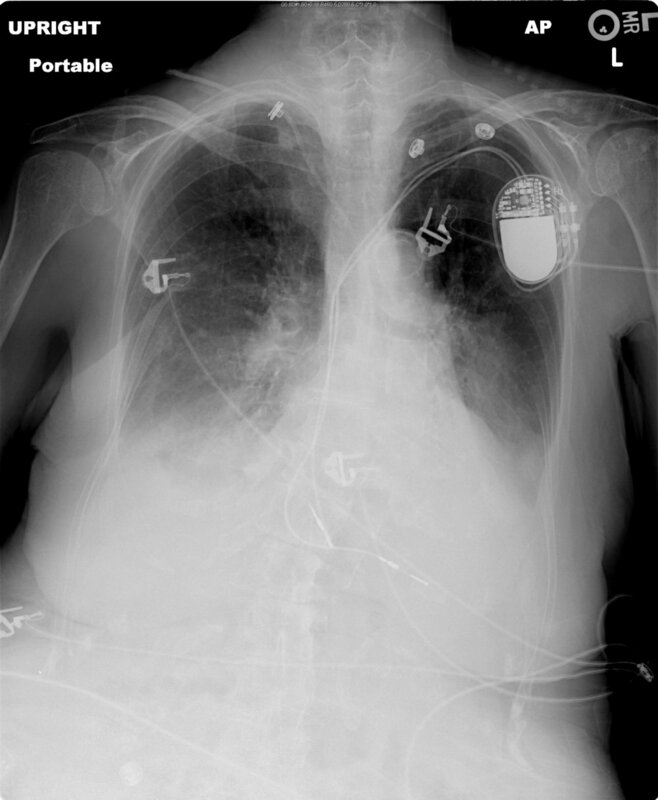 Case 1 answer: This patient has pneumomediastinum. Air appears as curvilinear lucencies outlining the mediastinum. Note the continuous diaphragm sign- the entire diaphragm is visualized as air in the mediastinum separates the heart and the superior surface of the diaphragm. Case 2 answer: This patient has a left shoulder dislocation. The humeral head is displaced from the glenoid of the scapula. Case 4 answer: The central line placed in the right neck soft tissue crosses the midline. This line was placed in the carotid artery. Case 5 answer: Misplaced tooth. Notice the ovoid, radiopaque foreign body in the right mainstem bronchus. Case 6 answer: This patient has a left lower lobe pneumonia. There is a positive spine sign on the lateral projection. The spine normally becomes more radiolucent as you progress inferiorly given the increased amount of air containing lung overlying the spine as you travel downwards. Where there is fluid, a mass, or a consolidation in the lower lung fields, the vertebral bodies appear more radiodense. Case 7 answer: This patient has Chilaiditi syndrome. In this syndrome, the colon is positioned between the liver and the diaphragm which can appear as free air under the diaphragm. Notice the rugal folds, this helps differentiate bowel containing gas from free air. Case 8: Find the abnormality. Case 8 answer: This patient has a left pneumothorax. This patient is supine at the time of this image (like many of our back-boarded and collared trauma patients). Notice the abnormally deep costophrenic angle on the left. This is known as the deep sulcus sign and is present because air collects in the non-dependent potions of the pleural space (anteriorly and basally when the patient is supine, apex when the patient is upright). Case 9 Answer: This x-ray is NORMAL. It looks like this patient has a left pneumothorax on first glance, but the pleural line you think you see is actually a skin fold. (7) Notice that the pulmonary vessels extend to the outer edge of the lung fields. For more information, check out: http://www.wikiradiography.net/page/Patterns+of+Misdiagnosis+in+Plain+Film+Radiography section 16 on artifacts. Case 10: Find the Abnormality. Case 10 Answer: The OGT is malpositioned and is entering the right mainstem bronchus and terminating in the right lung. Case 11: Find the Abnormality. Case 12: Find the abnormality. Case 12 Answer: This patient has extensive pneumomediastinum extending cranially into the neck. There is extensive soft tissue emphysema about the chest wall. This occurred after a coughing fit (believe it or not). No evidence of pneumonia or pneumothorax is seen, although it is difficult to visualize the lung fields with the overlying subcutaneous emphysema. Chest x-ray interpretation is a vital skill as errors can lead to missed diagnoses and worse patient outcomes. Adopt a systemic approach to reading a chest x-ray and use it every single time. Use the ABCDEF pneumonic to guide your interpretation and to avoid overlooking an abnormality that are hiding in plain sight. Drew T, Vo ML, Wolfe JM. The invisible gorilla strikes again: sustained inattentional blindness in expert observers. Psychol Sci 2013;24:1848-53. Petinaux B, Bhat R, Boniface K, Aristizabal J. Accuracy of radiographic readings in the emergency department. Am J Emerg Med 2011;29:18-25. Safari S, Baratloo A, Negida AS, Sanei Taheri M, Hashemi B, Hosseini Selkisari S. Comparing the interpretation of traumatic chest x-ray by emergency medicine specialists and radiologists. Arch Trauma Res 2014;3:e22189. Soudack M, Raviv-Zilka L, Ben-Shlush A, Jacobson JM, Benacon M, Augarten A. Who should be reading chest radiographs in the pediatric emergency department? Pediatr Emerg Care 2012;28:1052-4. Nitowski LA, O'Connor RE, Reese CLt. The rate of clinically significant plain radiograph misinterpretation by faculty in an emergency medicine residency program. Acad Emerg Med 1996;3:782-9. Baldwin KD, Ohman-Strickland P, Mehta S, Hume E. Scapula fractures: a marker for concomitant injury? A retrospective review of data in the National Trauma Database. J Trauma 2008;65:430-5. 32 year old right handed man presents with right thumb pain after a mechanical fall from standing onto steps. While falling, his outstretched thumb caught on a step. He denies other injury. On exam, he has pain and swelling at the thumb MCP joint. There is a palpable lump on the ulnar side of the base of his thumb. He has full ROM and intact strength in the affected digit. What are the next steps in this patient’s management? Traditionally, this injury was originally described in people who manually and repetitively sacrificed small game by breaking the animal’s neck. Angulation of >35 degrees, or a difference of >15 degrees between hands signifies a positive test. Present in up to 50% of complete UCL tears. Stressing the MCP has NOT been shown to cause a Stener lesion where one did not already exist. For stable injuries, non-urgent follow-up within 4 weeks is recommended. Germano, T. Falls on the Out-Stretched Hand and Other Traumatic Injuries of the Hand and Wrist: Part II. Emergency Medicine Reports: The Practical Journal for Emergency Physicians. Volume 28, Number 18. August 20, 2007. Gammons, M et al. Ulnar collateral ligament injury (gamekeeper's or skier's thumb). Retrieved from UpToDate.com. Accessed 4/21/2018.